[113 Pages Report] The RSV diagnostics market is expected to reach USD 929.2 Million by 2022 from USD 574.3 Million in 2017, at a CAGR of 10.1%. Market growth is primarily driven by the rising burden of RSV infections, growing demand for PoC molecular diagnostic tests for the diagnosis of RSV infections, and increasing approval of RSV diagnostic kits and assays. The base year considered for the study is 2015, and the forecast has been provided for the period between 2016 and 2021. Top-down and bottom-up approaches were used to estimate and validate the size of the global RSV diagnostics market and to estimate the size of various other dependent submarkets. The overall market size was used in the top-down approach to estimate the sizes of other individual markets (mentioned in the market segmentation—by products and region) through percentage splits from secondary and primary research. The bottom-up approach was also implemented (wherever applicable) for data extracted from secondary research to validate the market segment revenues obtained. The major players in the RSV diagnostics market are bioMérieux (France), Abbott (US), Roche (Switzerland), BD (US), Thermo Fisher (US), Luminex (US), Danaher (US), Biocartis (Belgium), and Hologic (US). This report provides insights into the global RSV diagnostics market. It provides valuable information on the products, methods, and regions in the RSV diagnostics market. The geographic analysis for these segments is also presented in this report. Leading players in the market are profiled to study their device offerings and understand strategies undertaken by them to be competitive in this market. The above-mentioned information would help the buyer understand market dynamics. In addition, the forecasts provided in the report will enable firms to understand the trends in this market and better position themselves to capitalize on the growth opportunities. In 2014, bioMérieux acquired BioFire Diagnostics (US). In 2015, bioMérieux commercialized its FilmArray multiplex PCR system. In 2016, Abbott received the US FDA and CLIA waivers for its Alere i RSV Rapid Molecular Test and Alere Reader Lateral Flow Assay Analyzer. In 2017, Abbott acquired Alere Medical (US). Also in 2016, the company opened its diagnostics manufacturing facility in Manesar, Haryana, India. A wide array of tests are available for RSV diagnosis, including molecular diagnostic tests, viral culture tests, rapid tests, serology tests, and rapid immunoassays. Players are focusing on combining these technologies and rapid immunoassays to develop the best approach to diagnose RSV infections. For instance, Becton Dickinson (US) has developed the Veritor System, which is a combination of rapid immunoassay diagnosis with fully automated point-of-care instruments that offer high accuracy and sensitivity. Similarly, Quidel (US) has developed the Solana Assay, which includes molecular as well as traditional and next-generation immunoassays. As compared to immunoassays, the demand for molecular testing of RSV infections is increasing in hospitals and reference laboratories. Moreover, a number of CLIA waivers and US FDA clearances are supporting the adoption of molecular diagnostic tests in physician offices and urgent care clinics. Since RSV infections have a higher prevalence among infants and young children, the adoption of molecular diagnostics is increasing as compared to immunoassays in this patient group. Rapid immunoassays are preferred whenever a quick estimation of the infection is required in inpatient and outpatient settings as well as for community surveillance; however, for the confirmation of the infection, molecular diagnostic tests are deployed to better evaluate the entire course of infection. Opportunities Assessment: A detailed report underlining the various growth opportunities presented in the market. The RSV diagnostics market is expected to reach USD 929.2 Million by 2022 from USD 574.3 Million in 2017, at a CAGR of 10.1%. Market growth is primarily driven by the rising burden of RSV infections, growing demand for PoC molecular diagnostic tests for the diagnosis of RSV infections, and increasing approval of RSV diagnostic kits and assays. This market is segmented based on products, method, end user, and region. The global RSV diagnostics market is segmented based on product, method, end user, and region. By product, the global market is segmented into kits and assays, instruments, and other products. The kits and assays segment is estimated to account for the largest share of the global market in 2017. Factors driving the growth of this segment include the growing patient base of RSV disease and increasing demand for kits and assays for RSV diagnosis. The RSV diagnostics market by method is segmented into rapid antigen detection tests, molecular diagnostics, and other methods. The molecular diagnostics segment is estimated to account for the largest share of the global market in 2017. Growing demand for molecular diagnostic tests for the diagnosis of RSV infections, and increasing approval of RSV diagnostic kits and assays are the major factors driving the growth of this segment. The RSV diagnostics market by end user is segmented into hospitals and clinics, clinical laboratories and home care. The hospitals and clinics segment is estimated to account for the largest share of the global market. Increasing burden of RSV disease among children, increasing demand for RSV diagnosis in hospitals and clinics and increasing adoption of PoC molecular diagnostic devices in hospitals and clinics for RSV diagnosis are the major factors driving the growth of this segment. 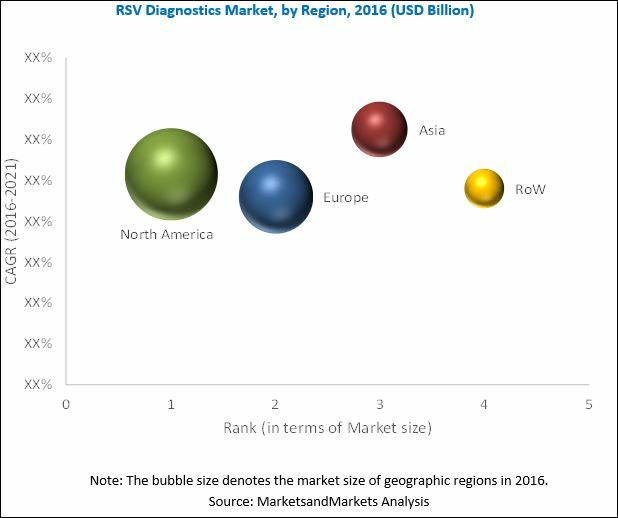 The global RSV diagnostics market is dominated by North America, followed by Europe. North America will continue to dominate the global market in the forecast period. However, Asia Pacific is expected to witness the highest CAGR. Factors such as the increasing burden of infectious disease such as RSV and focus of major players in emerging Asia Pacific countries are driving the growth of the RSV diagnostics market in this region. While development of a RSV vaccine in the forecast period is expected to be a major challenge for the global market. New technologies such as filament-based antibody detection assays, thin layer-based amperometric enzyme immunoassay (EIA), and multiplex virus testing are in the final stage of development. Furthermore, nucleic acid amplification techniques and loop-mediated isothermal amplification will soon be aligned with PoC devices. This will allow testing to be performed using a one-step kit, which will require only the addition of a patient sample. Also, the nanoparticle technology, which has the potential to bring about a four-fold improvement in viral detection as compared to RT-PCR (the current gold standard), is under development. Similarly, plasmonic detection techniques such as localized surface plasmon resonance (LSPR) spectroscopy (which uses metallic nanomaterials by exploiting physicochemical peculiarities) are under development with PoC detection devices. This is considered as a major development as methods such as LSPR spectroscopy offer rapid diagnostics and superior sensitivity & affordability as compared to techniques such as surface-enhanced Raman spectroscopy (SERS) and PCR coupled with electrospray ionization mass spectrometry (PCR-ESI-MS), which are not cost-effective, cumbersome to perform, and are more limited to research purposes. In the next few years, all the above-mentioned technologies are expected to be included in commercialized diagnostic methods. This is considered as a potential growth area for players operating in the global RSV diagnostics market. 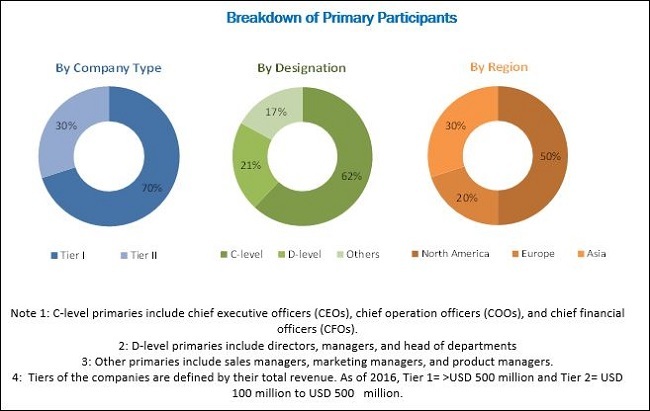 Key players in the RSV diagnostics market are RSV diagnostics market bioMérieux (France), Abbott (US), Roche (Switzerland), BD (US), Thermo Fisher (US), Luminex (US), Danaher (US), Biocartis (Belgium), and Hologic (US).